Although some 36,000 Mennonite immigrants passed through the province of Quebec on their way to new homes in Ontario and western Canada, none remained in Quebec. In 1956 the Mennonite Board of Missions and Charities (MC) and the Mennonite Conference of Ontario sent two Ontario couples, Tilman and Janet Mills Martin and Harold and Pauline Short Reesor, to Quebec. They were to begin a Mennonite mission outreach in this solidly French and Roman Catholic province. In 1957 and 1958 church planting efforts began in the cities of Montréal-Nord and Joliette. Two other French congregations have since been established in Rawdon and Rouyn-Noranda; also an English and a Hispanic congregation in Montreal. Membership of the five congregations in 1997 numbered approximately 112. In 2006 there remained two French and one English congregations that numbered approximately 80 members. In 1982 the supporting Ontario conference changed its name to Mennonite Conference of Ontario and Quebec (MCOQ) in recognition of the Quebec churches. These congregations all became part of the inter-Mennonite Mennonite Conference of Eastern Canada (MCEC) in 1988. The Mennonite Brethren Church, through its Canada Inland Mission, began work in Quebec in 1963. They sent Ernest Dyck and Lydia Krahn Dyck, former missionaries in the Democratic Republic of Congo (formerly the Belgian Congo, then Zaire), to the city of St-Jérôme. Other French congregations followed in Charlesbourg, St-Donat, St-Eustache, St-Laurent, New Richmond, Ste-Rose, and Ste-Thérèse. These congregations were recognized as a provincial conference by the Canadian Conference of Mennonite Brethren Churches in 1984. Membership in the province totaled 612 in 1996. In 2003 the Mennonite Brethren had seven congregations and a membership of 444. A third group, the Brethren in Christ, sent David Miller and Patti Gilles Miller to Quebec City in 1981. A congregation has been established in the suburb of St-Romuald. The Church of God in Christ, Mennonite has also established a congregation in Montreal in 1988 and later in Roxton Falls. In addition to church planting, the Mennonite churches also began Institute Biblique Laval (now École de Théologie Évangélique de Montréal, which is Mennonite Brethren), Camp Peniel (Mennonite Brethren), Camp le Sablier (formerly MCEC; now privately owned), and the Montreal House of Friendship (Mennonite Central Committee Canada and MCEC). The Montreal House of Friendship, a community center located in a low income neighborhood of downtown Montreal, was established in 1973. Its activities focus on refugee assistance, including language classes, family services, social activities, community meals on a weekly basis, computer classes, immigration orientation, and short-term housing. Some 50 Mennonite Central Committee volunteers have served in these programs. It is also the meeting place for English and Hispanic Mennonite congregations. Handbook of Information 1983-84. Newton, KS: General Conference Mennonite Church, 1984. Mennonite Yearbook & Directory, 1984, ed. James E. Borsch. Scottdale, PA: Mennonite Publishing House, 1984: 17. Mennonite Yearbook & Directory, 1997, ed. James E. Horsch. Scottdale, PA: Mennonite Publishing House, 1997: 43-45. 8 microfilms of Mennonite Brethren archival records are found in Centre for Mennonite Brethren Studies. Martin-Koop, Robert. 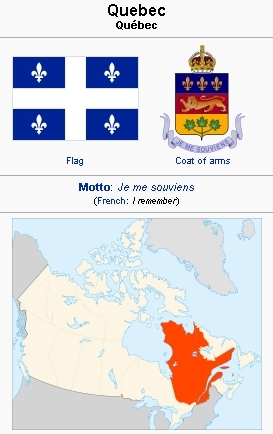 "Quebec (Canada)." Global Anabaptist Mennonite Encyclopedia Online. 1990. Web. 22 Apr 2019. http://gameo.org/index.php?title=Quebec_(Canada)&oldid=138908. Martin-Koop, Robert. (1990). Quebec (Canada). Global Anabaptist Mennonite Encyclopedia Online. Retrieved 22 April 2019, from http://gameo.org/index.php?title=Quebec_(Canada)&oldid=138908. Adapted by permission of Herald Press, Harrisonburg, Virginia, from Mennonite Encyclopedia, Vol. 5, p. 740. All rights reserved.